The facet joints are located between the vertebral bones of the spine and are often associated with back pain. Facet joints can be injected under x-ray or CT guidance with a combination of anaesthetic and anti-inflammatory steroid (such as cortisone) to provide relief from pain. The pain relief can last from weeks to months, however, in some instances no pain relief benefits are perceived. No specific preparation is required for a facet joint injection, although you may be asked to fast before your appointment. Please inform us when booking your appointment if you are taking blood thinning medication (e.g. Warfarin or aspirin). Please continue to take take all your other usual medications and if you are diabetic, please adhere to your normal diet. You will be asked to lie flat on the CT table, on either your stomach or back depending on the region of the spine being injected. The area will be cleaned and injected with local anaesthetic. 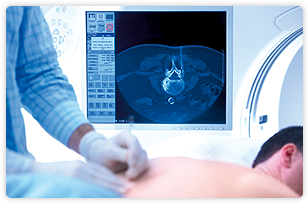 Using x-ray or CT scanning guidance, a Radiologist (doctor) will carefully place a needle into the facet joint. Usually a combination of local anaesthetic and steroid solution will be injected. This may be uncomfortable for a short time during the injection, until the injection starts to take effect. You may be asked to remain in the clinic for a short period of observation after your injection. It is suggested you minimise physical activity for 24 hours after the injection. It may take up to 48 hours for the injection to begin to take effect. The degree and duration of relief is quite variable. Many patients experience complete pain relief for months or even years. Some, unfortunately, may experience little or no benefit. There may be slight soreness or bruising at the injection site, and some patients may experience temporary numbness around the injected area. It is uncommon for the procedure to cause headache. Other more serious side effects or permanent neurological damage are very rare. If you have any questions or concerns please speak with the Radiologist or your referring doctor. All potential side effects will be discussed with you when obtaining your consent for the procedure.